Nitrous Powered 1980 Suzuki Gs1150 Pro Street Bike Kills It At The Man Cup World Finals Event! Get an up close and personal look at the wickedly fast old school nitrous powered 1980 Suzuki Gs1150 pro street bike! It is not all too often that a vintage bike like this takes on the strip, but it certainly should not be underestimated. In fact, the bike takes on the track at the Man Cup World Finals event at Valdosta, SGMP 2015 with great vengeance.Built by Brad Mummert to be a little different than the other Suzuki’s dominating the class, this bike is ultra lightweight with a full Carbon Fiber set of body panels and even sub-frame sections built by Montgomery Motorsports. To check it out in action click below! Born Free 3 Trophy Winner: 1963 Triumph Bonneville T120 Chopper! 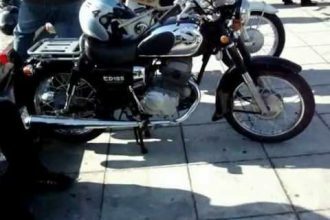 Incredible Collection Of Classic Motorcycles At The Tour Of Athens! Everything You Need To KNOW About A 1936 EL Knucklehead!! !